Jess-KITCHEN-Lab: Authentic Sabah Dish "Tuaran Mee"
" Tuaran Mee " is a noodle originated from Tuaran, my hometown. Its a freshly homemade egg noodles that tasted the best among all the normal egg noodles in the market around kota kinabalu city. The noodles is specially made from batter of egg yolk and flour, which gives the aroma of egg when fried. There are few steps of frying it and its usually takes about 10 minutes or so that leaves a texture of golden crust at the bottom of the noodles and the smells just irresistable. the noodle used local vegetables such as sawi/pak choi/whatever vegys you prefer are added in during frying. whenever i leave town, i always want to have another plate of tuaran mee to fulfill my desire before i craving for good. so i start to be creative again! want to try cooking my own Tuaran Noodle..... i failed many times and find it so hard to handle tuaran noodle. but i have never give up on trying to cook this bloody noodle too at the sametime, finally one day, i bought some freshly made tuaran noodle from one of the tuaran noodle supplier with her very own restaurant, she explain how to actually cook and handle the noodle with its very own steps, so with her explaination and infor that i gather from the internet and do some comparison, i am finally on my way to cook a good dish of Tuaran Noodle of my very own. I finally succeeded my first ever tasted "Tuaran Mee" just like any other fried Tuaran Mee at the eatery outlets. im so pleased with my result. I think i will forever lOVE Tuaran Noodle, i ate this since i was a kid....just love the smell of it too. 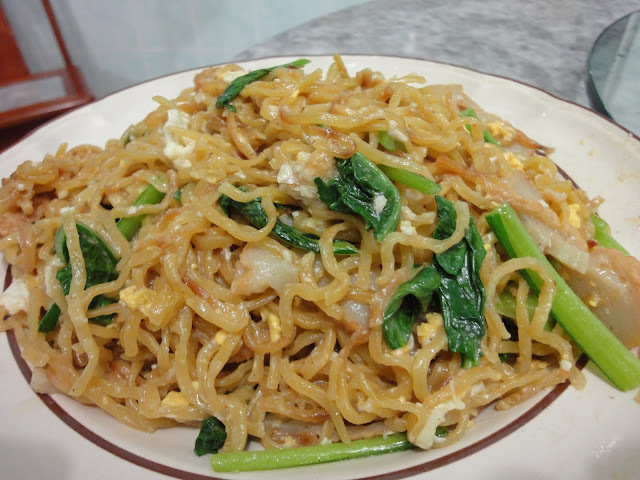 * Heat oil on wok to deep-fried tuaran egg noodle till golden brown / harden and aromatic, dish and drain. * Heat wok, 3 tbsp cooking oil to wok, put in egg and put in the fried tuaran noodle on top of the egg, add water just enough to cover half of the noodle and cover with lid let it steamed for 2 minutes. * open lid, turn over to steamed the other side of the noodle again, add in seasoning and meat items closed lid and let it steamed for a minute or so ( you can add more water if the noodle soak all water away while the noodle still hard ), open lid and mix well noodle and egg add in vegetables. stir and start frying the noodle till aromatic, served hot. NOTE : if you served with roasted pork and egg rolls, you may added after the noodle was cooked and for some prefer to have a little crispy taste of the meat items like fresh fish fillet or chicken cube, you may do so to deep-fried it first before it added in the process of cooking.